If this isn't the most beautiful magazine cover in the world, I don't know what is. The Most Dangerous Invention in the World. The Car. 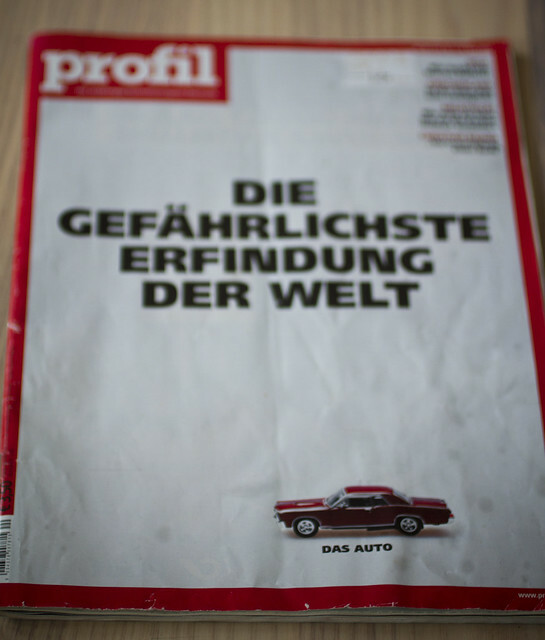 It's the cover of Profil magazine, out of Austria. I picked it up in Vienna earlier this year. As I understand it, Profil is a business magazine. Leafing through it, it's filled with men in suits saying stuff in German. This article, however, is beautiful for its stunning rationality. It's a bold cover and the accompanying article spells out why the car is, indeed, the most dangerous invention in the world and so destructive to our societies. 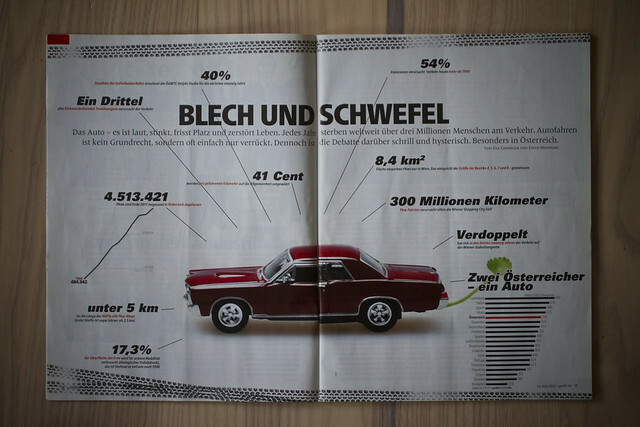 Unfortunately, my German is rather dodgy but that's what infographics are for! Vice-Mayor and Vice-Governor, Executive City Councillor for Urban Planning, Traffic & Transport, Climate Protection, Energy and Public Participation. She doesn't need a business card, she needs a t-shirt. 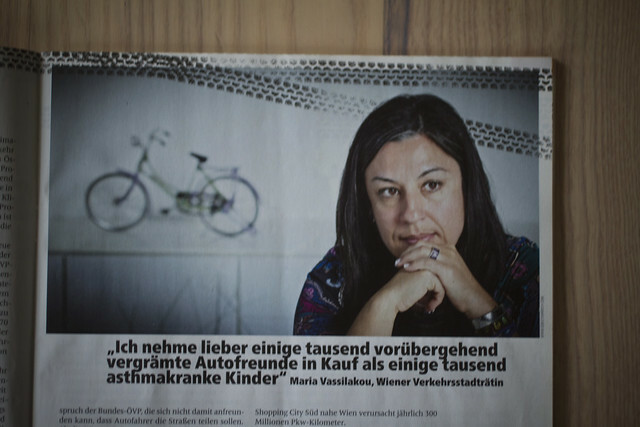 But hey, times are a'changing in Vienna and Ms Vassilakou is behind the movement for a more liveable city. If only such visionary politicians grew on trees. The article, in German, is available online right here. Hopefully your German reading skills are better than mine. I'll leave you to it. The most important thing is that this magazine cover and this article exist. A paradigm shift is imminent. Designing cities and streets instead of over-engineering them. Thinking about quality of life instead of traffic data flow. Nice to see that some cities are taking their responsibility seriously. 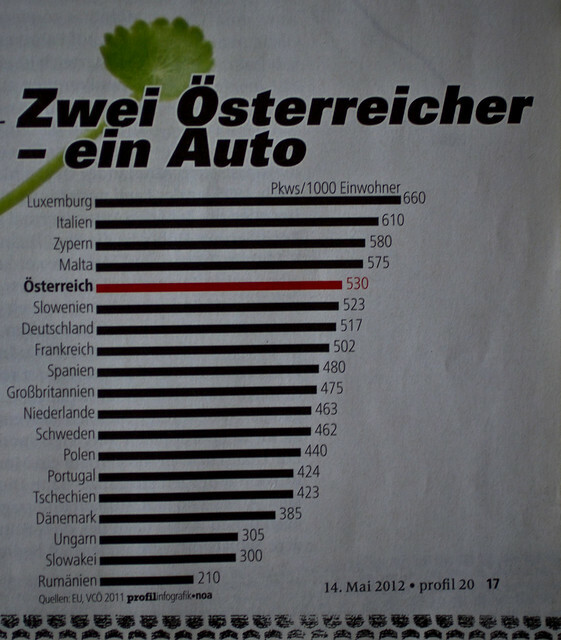 This is a list with car ownership stats for various countries. Austria is high on the list. Who knew that the Dutch owned so many cars?